Due to the weight in the lorry, & storage space issues, I'm going to have to sell my TAC Scorpion desk, and it's corresponding monitor desk. I've run the desk about 5 or 6 times a year for the past 5 years, & have never had a problem with it, except it's quite large! 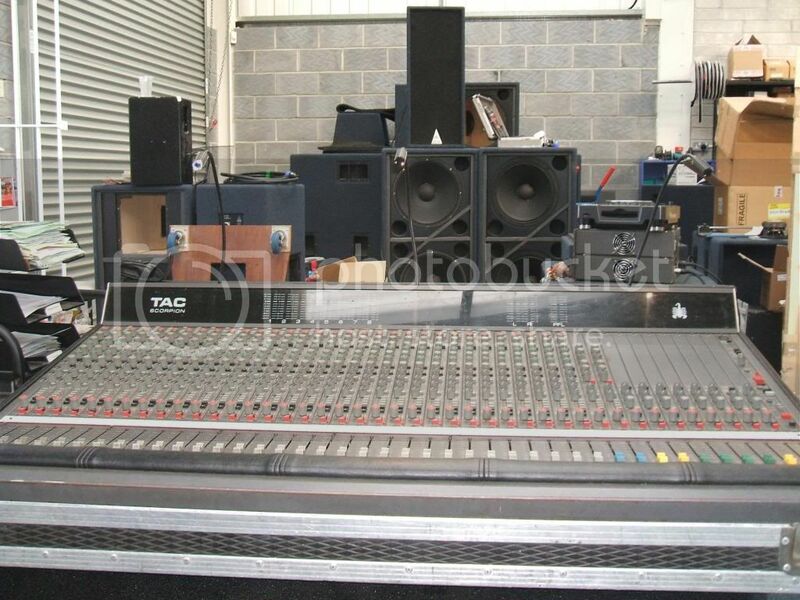 Most of my jobs are dance music based, with 2 or 3 bands a day, but I have done some '12-bands-in-a-row' type gigs too. All working last time it was used for Bearded Theory festival, in Derbyshire last year. The Monitor volume pot was snapped off, and I have replaced it with a correct value pot, which works fine, but doesn't have a knob on it. There is also one pot for the aux send on the 7th group that has it's pot snapped off, but i've never had to use it, so never fixed it. 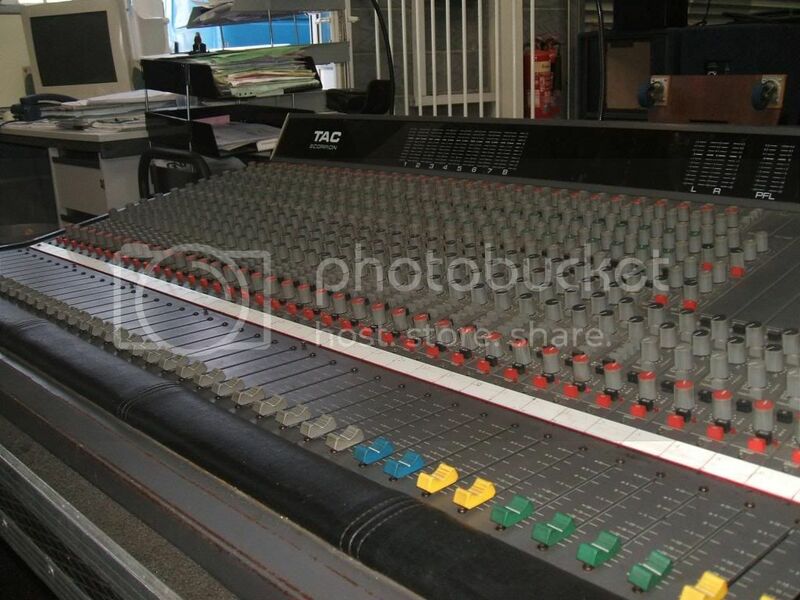 This is an old pic, from when I 1st got it, and have since fixed the two pots on the Monitor & talkback are now fixed. 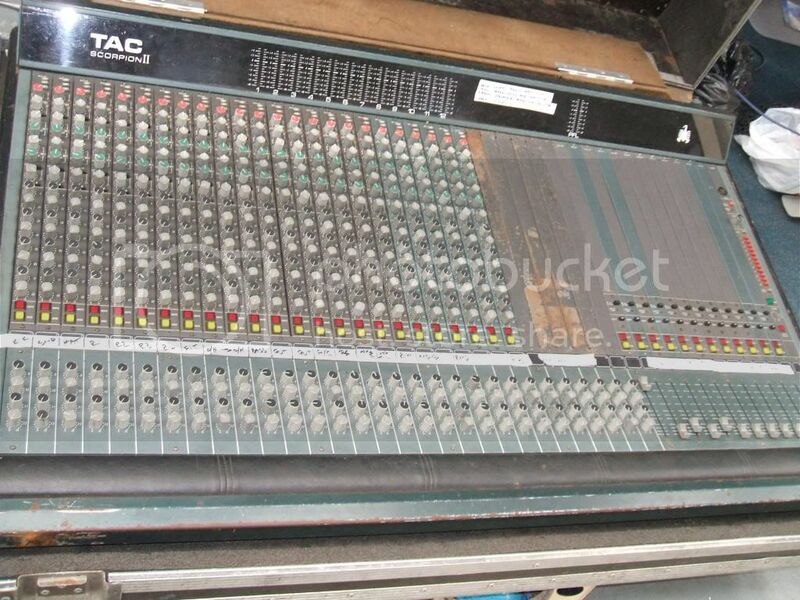 We we're using the TAC as a monitor desk once, with a Soundcraft GB8 on FOH. 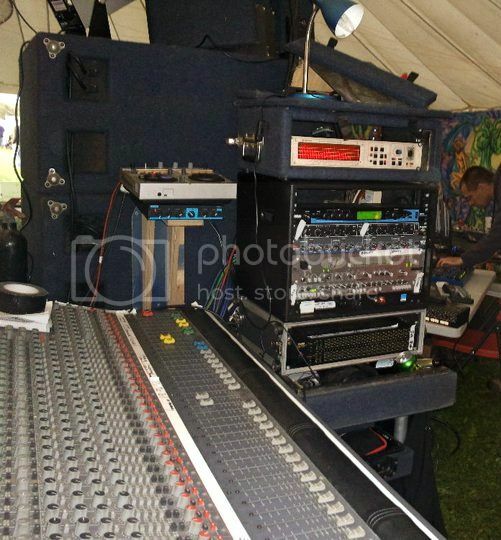 Well the rain came down, and the FOH tent turned out to be entirely un-waterproof, & the GB8 went fizzle bang pop. 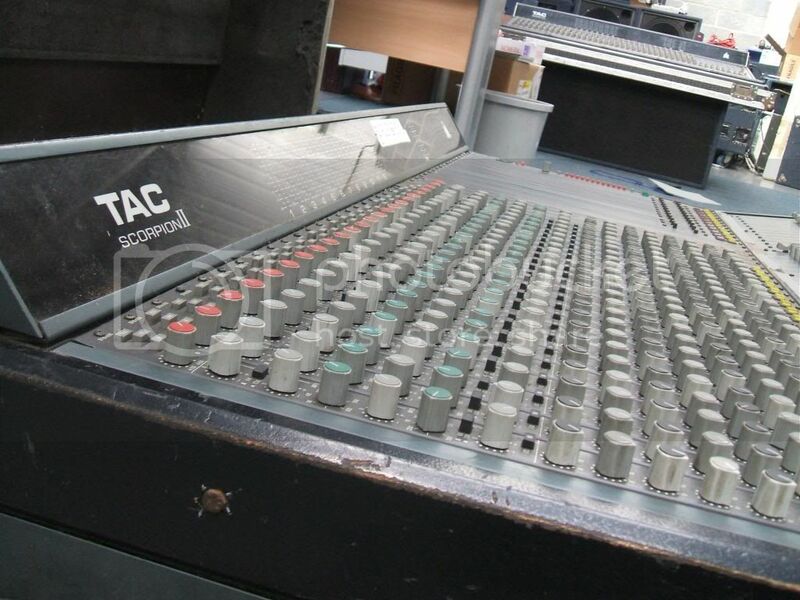 Luckily I run the main outs on the FOH, the monitor desk and the DJ mixer into a balanced switch unit, so we were able to switch to the TAC, and in a matter of a minute or 2 we were up & running again, and I tell you what, the improvement in the sound quality was simply stunning! The monitor desk is a Scorpion 2 desk, and looks pretty rough. I've never used it, so can't say if it works or not, but it did (apparently) when I first got it. Even if it doesn't, there's a heap of spares & stuff in there. Both desks are flight cased, although one of the cases is a bit rough around the edges, & the flip catches are loose, but they do hold the lid on. I travel around the country quite a bit in the summer, so delivery might be possible, but I'm not going to drive all around the country with it just so you can have a look, sorry. 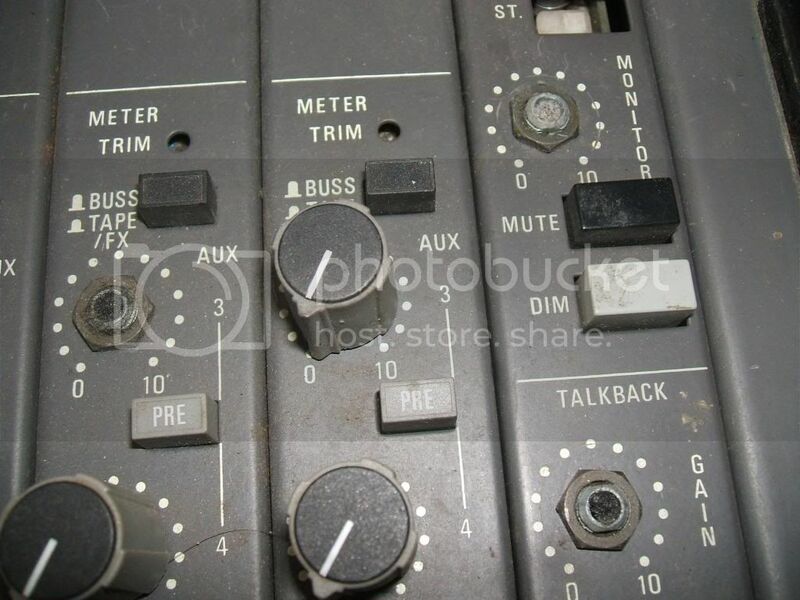 No doubt it could probably do with a re-cap, but basically, a bit of switch cleaner and/or fader lube & it'd be up & running. If you'd like to come & have a look, then I'll do my best to set it up, so you can hear it running. I have a studio in Redruth that might be the best place to do this, or if it's sunny, then we might be out in the garden. You can contact me on here, or call 0 7 8 5 2 2 O 9 8 5 9. Odd, I can only see half the photos on this forum, but if you click & drag the photos to your desktop, you should see the whole pictures. I see all the photos, maybe it's a browser issue? What platform/browser are you using? That's on Firefox, but i've tried Safari as well, & it's the same thing. However, if you [right click] 'open image in new window' then it shows the whole pictures. The top pic is a thin pic anyway, but the others should show the whole desk(s). What OS and what browser versions? Latest build? OSX 10.6.8, and latest Firefox, I believe. It might be a photobucket thing maybe. no worries though, I can see the left hand side of the pics. It was more for anyone else looking really. Can you see the whole desk in pic 2? Did i read that correct? Drive to Hastings this summer?